With a fixed set of questions, this series aims to showcase interesting Swiss projects in Agricultural Research for Development. What do we see on the project photo? 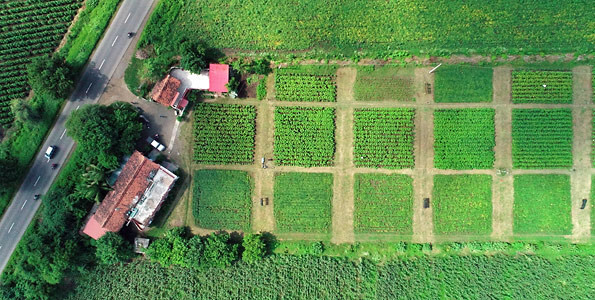 The photo shows an aerial view of the long-term field experiment of the farming systems comparison (SysCom) project on the bioRe research station in Nimar valley, central India. The bottom row is planted with soybean, the middle row with cotton. The top row comprises of on-station pilot trials for participatory technology development. How would you explain to a child what the project is doing? In this project, we compare the advantages and disadvantages of organic and conventional farming systems on a long-term basis. We study a cropping system comprised of a cash crop (cotton), a staple food (wheat) and a pulse (soybean). What is the project’s main objective? Our aim is to observe and quantify differences in soil quality, productivity, economic profitability and environmental impact due to different farming practices, so that farmers can choose the most suited system and policy makers have scientifically backed evidence to decide which farming system they are going to support. The SysCom project provides so far largely lacking information on the performance of organic vs. conventional farming systems in tropical climates. By quantifying the environmental (and economic) benefits of organic production, the use of agro-chemicals can potentially be reduced. The project also develops new locally adapted technologies in a participatory manner. What has been the most positive moment during the project? In an external evaluation carried out in 2017, the project was acknowledged and appreciated for its unique contribution to the development of solutions for sustainable farming in collaboration with local farmers. What have been the biggest challenges encountered in the project? Being located in a remote location, the availability of qualified research staff has been a significant challenge. We addressed it by recruiting personnel based in the area and by investing resources to train them appropriately. Which is the most important lesson learnt from the project? So far, we found that legume crops such as soybean can perform equally well in organic and conventional systems. In the case of cotton and wheat there remain some yield gaps which can largely be explained by lower N supply and a lack of suitable varieties. Moreover, the yield variation between farms is much larger than among production systems. The cost-benefit ratio of organic production is clearly higher, making it more suited for resource-poor farmers. In this photo, a farmer from the Dormaa West district of Ghana is seen drying his cocoa beans. Like most cocoa farmers, he and his household depend on cocoa for livelihood. If cocoa yields decline, his entire household becomes vulnerable. Therefore, solutions must be found to compensate for potential losses. When there is good weather, farmers harvest a lot of cocoa and can pay their children’s school fees. When there is too little rain, they don’t get enough cocoa and their children can’t go to school. I asked farmers whether they want to get an insurance that will help them in years with bad yield. This work aimed to determine cocoa farmers’ willingness-to-pay (WTP) and factors that can influence their WTP for index insurance. It also tried to analyse organisational and institutional factors that can affect the provision and adoption of index insurance in Ghana. Extreme weather events, owing to climate change, can lead to low cocoa yield. Yield decline threatens the livelihood security of affected farmers. Index insurance, if properly planned and implemented, can increase farmers’ resilience and enhance their adaptability to climate change and its negative impacts. Farmers showed great interest and willingness to embrace the idea of index insurance. To them, insurance can provide security and encourage the youth to go into cocoa farming. Some farmers still contact me from time to time and ask when the insurance will finally come on the market. It was difficult to assess individual farmers’ yield. Furthermore, it was impossible to get information about weather data from the Ghana Meteorological Agency at the time of the study. Yield and weather data are crucial for designing a successful index insurance policy. My initial idea was to talk to farmers and insurance companies. Then I found out that a lot more stakeholders have to be involved, for example meteorological agencies, extension service, microfinance institutions, NGOs, donor agencies, research institutions, cocoa buyers, reinsurers and especially the Ghana Cocoa Board. 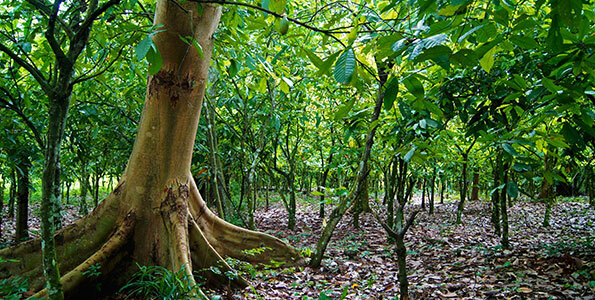 The photo shows a shade tree (Ficus capensis) in a smallholder cocoa farm in Ghana. Shade trees are often planted in cocoa farms to help solve many of the problems facing cocoa production. But we know very little about how much shade is optimal and which shade tree species are most compatible with cocoa. Chocolate is made from cocoa. If you would like to keep eating chocolate, we have to make sure that farmers can keep growing cocoa. Including shade trees in cocoa farms could help protect cocoa from climate change and solve other problems too. I measured which shade trees and how many would do the best job. The goal of this project is to provide clear and achievable recommendations for the implementation of cocoa agroforests with shade levels and shade-tree species that best provide multiple benefits while minimizing multiple costs for cocoa production. 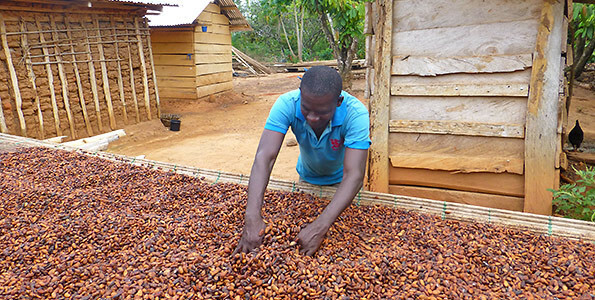 Cocoa is the main source of income for millions of smallholders in West Africa. But cocoa production is threatened by decreasing soil fertility, increasing pest and disease levels, and climate change. If implemented the right way, agroforestry could help to simultaneously solve many of these problems. What I hope is the most positive aspect of this project is that it is genuinely useful for smallholders and the cocoa industry, and might be another step in the right direction toward combatting some of the largest sustainability challenges we face, including climate change, biodiversity loss, and poverty. Cocoa is harvested every two weeks for approx. nine months of the year. Accurately measuring the effects of shade trees on cocoa yields therefore required an enormous amount of time in the field. James Oppong from the Ghanaian Soil Research Institute performed a heroic job assessing the cocoa harvest in our plots during the project. Cocoa agroforests with shade-tree cover around 30 %, and agroforests that prioritize timber trees, are superior to monocultures because they do not compromise production, while at the same time provide benefits for disease management, climate mitigation and adaptation, and biodiversity conservation. The project disseminates the push pull technology in Sub-Saharan Africa. The most essential part is thus to make the technology known among farmers. Here, an extension officer in Malawi explains the push pull technology to interested farmers during an orientation day with a total of 800 participants. To protect maize from being eaten by the Stemborer (an insect pest), farmers plant Desmodium into the maize field. The smell of Desmodium chases the Stemborer away (push). The row of fodder grass, planted around the field, attracts the Stemborer (pull). The yield from the field increases up to 3 times. icipe has developed, field tested and improved the push pull technology since the 1990s in East Africa. It was time to outscale! At the end of the current project, it is thus expected that more than 70’000 additional push-pull farmers have adopted the method in at least six countries outside East Africa. With maize and sorghum representing the main staple crops across Sub-Saharan Africa, sustainably improving their productivity represents a key motivation towards strengthening food security and alleviating poverty in the rural areas (and in extension achieving the Sustainable Development Goals 1 and 2). 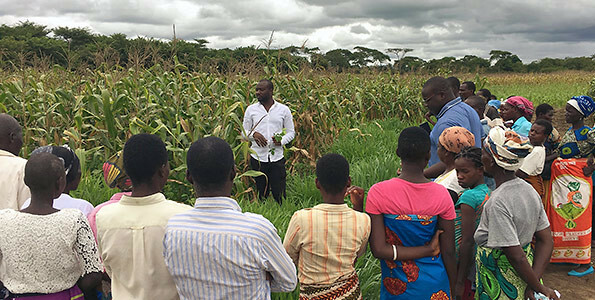 Alex Chingoli, a farmer from Malawi, was the first to report push pull being effective against the invasive and devastating Fall Armyworm. This information made the developers at icipe very happy. But it also demonstrated that information corridors work both ways. From research to adopter and back. Every country we work with brings along its own legal framework, governmental setup, local partners, customs and climate. Adaptation of the technology itself but also of the dissemination strategy is therefore a must for every single local context. Choose your partner(s) carefully, formulate your ideas and targets clearly, and connect instalments to deliverables. A smallholder farmer is carrying vegetables to sell them at a Farmers’ Hub (FH). The FH provided him with high quality seedlings, machinery and agri-advice services at all stages of production, resulting in higher yield. 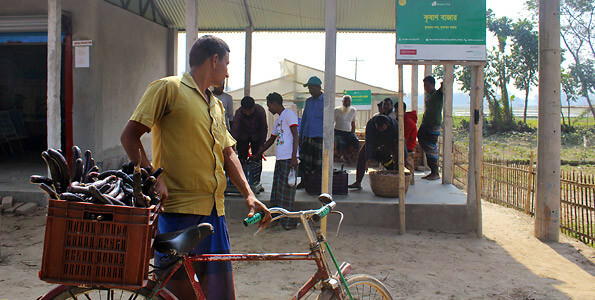 A FH is a strategic intervention to improve agricultural extension services in Bangladesh. The project empowers enthusiastic rural youths to become FH owners. They provide different types of services to farmers: agri-input sales, farm machinery rental, market linkages, agri and market information. Thus, farmers get higher yields and better deals from the FH’s. The main objective of the project is to increase income and livelihood opportunities for smallholders. The key strategy is to improve market access for primary producers to develop a market-led production system and to enhance the productivity by introducing technologies in a profitable way. Agriculture is a key source of income for smallholders. They are often underperforming due to a lack of access to quality inputs and output markets, information and modern technology. The project meets these challenges by enabling the provision of essential agri-services to farmers through FH. After 3 years of operation, a study by an independent consulting firm shows that the FH model is economically viable and FHs are able to run commercially without project support. The farmers associated with FH enjoyed 25% increased yield and 34% increased income compared to the baseline. Changing the mindset of the farmers and adopting the new technology as well as market systems were critical challenges for the project. The demonstration of new technologies, along with trainings, technical support and follow-up helped them to make the switch from their long-lasting habits. In the context of Bangladesh, co-operative entrepreneurship is not sustainable due to the delayed decision making process and internal leadership conflicts. It is better to support individual ownership entrepreneurs who are responsible for their own losses and profits. A farmer feeds his cow in a cut-and-carry system which is nowadays widespread in Malawi to avoid animal diseases. Nevertheless, there are productivity problems on Malawian dairy farms. IFS-SMADAP identified solutions such as improved forage crops, cutting management and fodder conservation techniques. Many cows in Malawi have health and fertility problems and farmers struggle to make a living. 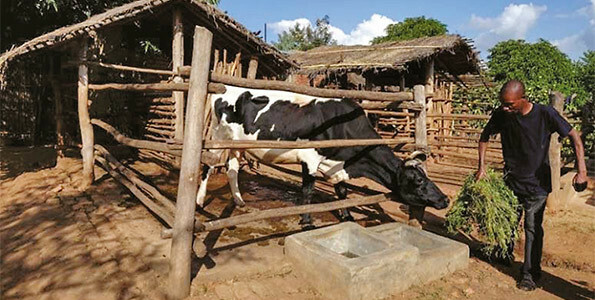 The project therefore analysed the situation on Malawian dairy farms and found that inappropriate breeds, lack of feed and poor housing systems are main problems. The project then proposed solutions to improve the situation. The project aimed to identify solutions to improve the productivity and profitability of Malawian dairy farms. Recommendations are i) to improve fodder conservation (cutting stages, storage); ii) to adapt feed rations to locality and lactation period. ; iii) to enhance cow comfort (bedding systems, hygiene); and iv) to focus on crossbreds. Dairy is a valuable income source ensuring liquidity throughout the year and supports balanced nutrition. It also plays an important role as a job creator in Malawi and contributes significantly to smallholders’ livelihood improvement. Specific initiatives such as an on-loan program could be established. A Milk Bulking Group (MBG) provided cement to selected lead farmers to build concrete floors in the pen. The farmers reimbursed the cement through milk price deductions which allowed to integrate other farmers of the MBG into the program. The distance between Agroscope as project coordinator and the local partners made it difficult to establish a reliable collaboration. E-Mail was often the means of communication, which is not appropriate for such a complex project. We had to remind our partners of agreements and duties many times. The local partner institutions tend to be overloaded with projects. This means that the projects are in competition with each other and a smaller project like ours is not high on the agenda. It is therefore important to agree on very clear conditions for collaboration - including sanctions. The picture shows a smiling woman transplanting rice seedlings somewhere in Cambodia: tradition and practices nourishing millions of people in Asia. 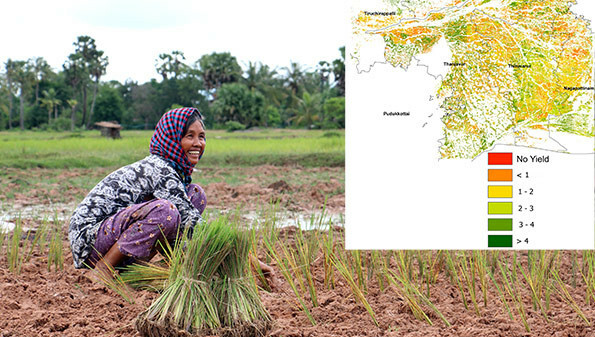 Next to her, a yield estimation map based on radar satellite data and modelling software: modernity and high-tech that shall enhance farmers’ resilience. RIICE is using high-end software and satellite radar sensors that can see through the clouds to detect where and how rice is growing and to estimate the production. This information is more reliable and available more rapidly than through traditional methods, and it is useful for many purposes. RIICE aims to make high-end remote-sensing technology work in practical situations and to develop national and local capacities in using them both for improving global food security as well as for supporting the dissemination of crop insurance for small farmers. Small rice producers face increasing risks of losing their harvest due to drought or flood. Crop insurances can help them to cope with such risks but they are often complex and costly to operate. Remote-sensing technologies can ease the insurance processes. India 2015: heavy rains provoked huge flooding in different regions. Thanks to the RIICE technology, Tamil Nadu University was able to assess the damages rapidly and helped the state authorities to deliver new seeds to the affected farmers within days. This was a big advantage compared to other cases. Besides the technology development which is a challenge in itself, it is not an easy task to demonstrate benefits and to convince decision makers - be they government officials or business people - to switch from long lasting habits to innovation within quite short project deadlines. Involving all concerned stakeholders from the very beginning of a process, striving to make science useful for practical and daily life and ensuring persistent and efficient popularization of complex topics - these are key elements to develop informed capacities and to ensure adapted solutions. The project is implemented as a partnership of all institutions mentioned above. This is Dha Grégoire, a yam farmer from southwest Burkina Faso, smiling because he harvested big yam. The area was a wooded grassland, but now it is a cropland with low tree density. On the left side on Grégoire’s back we see dead trees, burnt and left standing to be used as stakes for yam vines. 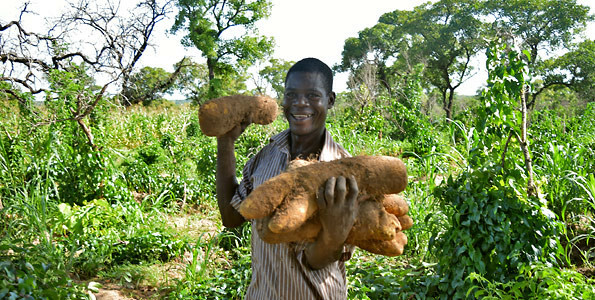 YAMSYS is giving a continuous smile to the yam farmers of West Africa by developing with them good techniques to better manage the soil and the crop to grow more and good quality yam. YAMSYS helps also other people depending on yam (traders, processers) to improve their livelihoods. In an inter- and transdisciplinary manner, YAMSYS aims to develop soil and crop management options that are biophysically, economically and institutionally acceptable in order to sustainably improve yam yields, food security and the income of all the actors along the yam value chain in West Africa. Yam feeds about 155 million people in the world and about 90% of its production comes from West Africa. Yam is also grown as a cash crop and a medicinal plant and has high cultural value for some communities. However, the agronomy of yam is neglected and YAMSYS is contributing to close this gap. The project implemented innovation platforms and identified soil management options with their members. The farmers selected their preferred options, tested them in their fields and were very proud to see yam yields multiplied by about 5 and yam tubers quality strongly improved. At the beginning of YAMSYS some farmers, although recognizing a decline of yam yields, were saying: “We know yam better than you researchers; we learned from our grandparents how to grow this crop; what could you teach us more?” Doing research with such empirical perceptions was challenging. For a research for development project like YAMSYS it is important to involve all types of farmers, including those who are sceptic, and to continuously communicate the research results to them because thereafter, these sceptic farmers become the ones who promote the results of the project most. 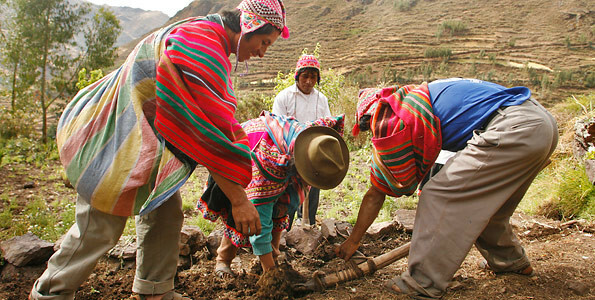 Four farmers in typical Peruvian clothes prepare the soil with traditional cultivation techniques. The picture provides a good insight into the environment of smallholder farmers in the Andean region, the principal target group of the Climandes project. Weather and climate influence how much and which food farmers produce. If they know early enough when it is going to freeze, for example, they can better protect their plants or animals and eventually their income. Climandes supports farmers in Peru by providing climate information that are meaningful to them. The weather services MeteoSwiss and SENAMHI Peru join forces with the project partners to provide high-quality and user-tailored climate services for climate-smart agriculture. Thereby, Climandes improves science-based decision making which, at the end of the day, promotes food security and poverty reduction. Climandes aims at increasing the resilience of vulnerable populations like Andean smallholder farmers and ultimately, society at large. To this end, the initiative enhances capacities in meteorology and climatology, establishes a user-dialogue and demonstrates the socio-economic benefit of climate services. The interviews with more than 700 smallholder farmers from the southern Andes in Peru demonstrated their positive attitude towards science-based climate information. This holds promise for the supply and use of climate services becoming mainstream. Cognitive or cultural differences between suppliers and users of climate services can constrain their application. This last mile in climate service delivery proved to be more challenging than expected. In order to overcome this gap, Climandes analysed farmers’ decision-making as well as the weather and climate products and the communication channels of SENAMHI. We learned that an ongoing dialogue with farmers is crucial. A participative approach allows effective tailoring and delivering of climate services and supports the credibility of science-based climate information. Such initiatives address wide-ranging needs, thus bear potential for becoming sustainable after the project end. 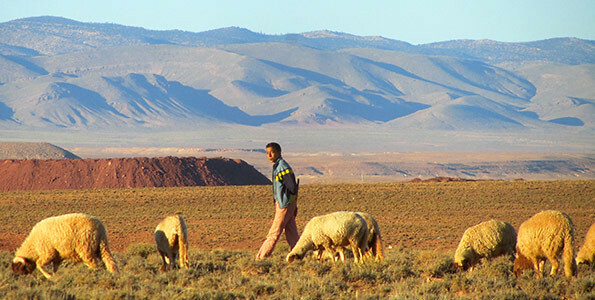 A young nomad herder with his sheep grazing on a ‘typical’ pasture in the Midelt Province, Morocco. While Midelt is located on an elevated plain at about 1500 masl, we can see high mountains in the background – the Atlas. We have chosen this photo to show the harsh natural conditions in a remote area being a strong limitation for agriculture and other sources of livelihood. Agriculture as a source of livelihood is very important for many people in less developed countries. However, it is often not attractive or even viable, particularly in dry areas where many young people leave their rural homes in hope to find ‘better’ sources of income in urban areas. The project is exploring how young people perceive farming, and what they would need to make it more attractive and viable, so that they do not have to leave their homes to make a decent living. Investigate the realities, viewpoints, challenges, opportunities and aspirations of rural, farming youth in the research site, in order to determine possible entry points for support and intervention aiming at improving their livelihoods. Active involvement of youth in agriculture is necessary for sustainable agricultural systems but is currently a challenge in many areas due to the presumed unpopularity and chronic neglect of agriculture, precarious living conditions, low attractiveness and viability of farming, etc. To avoid that even more young people turn away from the sector, they must be engaged in creating their own desirable farming futures. We conducted a focus group discussion with female rural teenagers, living in a poor and remote village with no access to secondary school. When we asked them to discuss and depict their village of their dreams, they got full of energy in showing their willingness to remain in their village and to see more development in agriculture and to create their own cheese cooperative. When asking the rural youth about their dreams and aspirations, some young women said they do not have the right to dream. Young male nomads shared their desolation of being hopeless to build a family, as no girl wants to marry a herder without a house and education. How can these conditions be improved? That youth’s perception of rural life and agriculture is not per se negative. There is considerable interest to develop their agricultural systems, in particular among young men who aspire to have their own profitable farms. Female youth aspire to access basic education and vocational training. Also, rural outmigration is not a first choice for many but rather driven by precarious living conditions.